Consecutive Up and Down Days: Why is it Important? What usually happens with the stock market in June? The first month of summer has shone brighter on Nasdaq stocks over the last 35 years as a rule ranking fourth with a 1.2% average gain, up 22 of 35 years. This contributes to Nasdaq's Best Eight Months which ends in June. June ranks near the bottom on the Dow Jones Industrials along with August and September since 1950. June's first trading day is the Dow's best day of the month, up fifteen of the last twenty-one years. Strength picks up day two for the broader market with Nasdaq leading the charge. Gains are sparse throughout the remainder of the month until the last two days when semi-annual Russell index reshuffling pushes Nasdaq and Russell 2000 stocks highest. It still amazes me that some visitors to this blog are subscribing via email updates. Sure, that is an option, but why do that when you can just add it to a feed reader? I don't know about you but I already get enough email! So, if you are not familiar with feed readers, I'm going to show you how to subscribe to stock market blogs (and other websites) so that you can quickly go through hundreds of stock market blogs in 5 minutes or less. First, you need a reader. There are many different types of readers that you can use like Google Reader and Bloglines. But my favorite one to use is NetVibes. The easiest way to learn how to use feeds is just to start doing it! Sign up at NetVibes (it's free). Once you have your account created, you can begin adding blogs and websites to your personalized page. Once you find a blog or website that has a news feed, you can add it to your Netvibes page. Then, you can have all your favorite blogs in one place. You won't have to visit each blog to see if they have added a something new - and you won't get any emails. Each of those boxes with the orange heading is a different stock market blog. So I can log in to my Netvibes account everyday and quickly go through all my favorite blogs (I have close to 100) to see what new stuff each blogger has posted. This is a HUGE time saver! 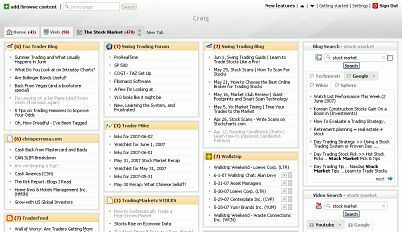 You can literally scan through 100 blogs in 5 minutes to find the stock market and technical analysis articles that interest you. And you won't have to deal with getting emails. You can find more blogs to add to your page under the "Blogs I Like to Read" section in the right sidebar of this page. Also, Trader Mike regularly publishes a list of stock market related links from around the blogosphere. And don't forget to add Dr. Brett's excellent blog, TraderFeed to your new Netvibes page. He publishes some of the best trading articles on the internet. "Why do you look for consecutive down days for long positions or consecutive up days for short positions?" This was the basis of an email that I got from a trader the other day. I realized that I never really explained why I think it is important for swing traders. The reasoning behind it is simple. It is MUCH easier to see the transition between buying and selling pressure when looking at consecutive up/down days. This stock had four consecutive down days (highlighted). On each of these days the sellers were stronger than the buyers since they were able to close this stock to the downside. So far so good for the sellers. Now look at what happened on Friday (green arrow). All of a sudden, there is an up day. The sellers are no longer controlling the direction of this stock. The buyers have taken over. This doesn't mean that the stock is definitely going to go up. But at least we can see the transition happening right before our eyes. It's almost like cheating! Now look to the left on the chart right around April 16th. See all of the consecutive down days? Things were looking real good for the sellers but then, all of a sudden, there was an up day. The buyers took over and it was off to the races! So this is really the whole point of swing trading. You are trying to identify the "transitions". Looking for consecutive down (or up days for short positions) makes it much easier. Do you get these in the mail? They advertise worthless penny stocks. They tell you that you can make a fortune. After reading so many of these over the years I have finally figured out how to make a fortune in penny stocks! I am going to reveal the secret right now! Buy a zillion shares of a penny stock. It doesn't matter which one as long as you can come up with a good story behind it that is somewhat believable (pharmaceutical stocks are a good choice here). Did you buy your shares? Good. Go to Kinkos and print up some nice mailings that explains how your penny stock is going to the moon (make sure they have lots of pretty pictures on them). You'll need to send out a few hundred thousand of them. Wait until the public gets suckered into buying your stock. This might take a little bit of patience at first (to speed up the process, just go to the Yahoo message boards and write about your penny stock once or twice a day). Once the buzz starts, the stock will skyrocket and you can easily dump your shares off to them before it tanks! Rinse. Repeat. If I thought a stock was going to go up 600%, the last thing I would do is talk about it. That is, unless I already had a huge stake in the stock. 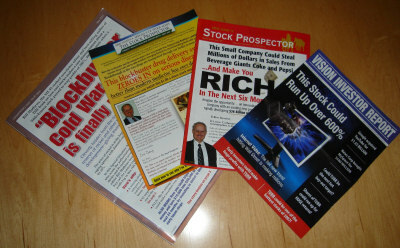 These mailings reminded me of a post that Ken Evoy wrote awhile back called Mooch Marketing.